Memories from the father (former players) echo to the children (new players). Part of Nintendo. Fire Emblem series producer. Part of Nintendo. Director of this game. In charge of FE0 (Cipher0. Intelligent Systems. Art director in Awakening and Fates, and works as director of this game. Intelligent Systems. A developer since Genealogy of the Holy War. Worked as producer on Fates. Adjusting the steep difficulty level for the current generation through a remake. Q: Please tell us the story of how this project came to be from the start. Mr. Hitoshi Yamagami (from now on: Yamagami): After the completion of Fire Emblem: Fates (from now on, just Fates)’s development, I started thinking of a game for the Nintendo Switch. However, it was still too early to begin development of titles for that system. While thinking of what to do, several people from Intelligent Systems approached me saying: “There are many things we could not do in Fates [that we wish we could have]. We wish to implement them in a remake for Gaiden.” Gaiden had not been featured much up until now, and I figured if we got started on development at that time, we would be able to release the game before the new Nintendo Switch would come out. So, we began development. Mr. Masahiro Higuchi (from now on, Higuchi): This is back in 2015. Higuchi: But there was no way I could meet that deadline while ensuring ultimate player satisfaction. (Laughs awkwardly). Q: What was it that you wanted to do with Echoes that was not in Fates? Mr. Toshiyuki Kusakihara (from now on, Kusakihara): For one, adding dungeons and allowing the character to roam around freely. In Fates, you can move around “My Castle” and see it over your shoulder view, but, the truth is by then we had already developed a fully functioning roaming function. However, it was not up to the standards we wanted, and so Fates was left with just being able to observe your surroundings [rather than move around in it]. Gaiden meanwhile was already built with free movement in mind, so we figured it was a perfect fit. Higuchi: In addition to that, Gaiden would be celebrating its 25th anniversary. While already released on the Virtual Console for people to enjoy, we had the idea of reconstructing it with the technology we had through Awakening and Fates. That’s basically how the idea for this remake came to be. Nakanishi: My father died when I was really young. I remember, though, that he loved Fire Emblem. He is the one who got me interested in playing the series, and taught me how to play. When my father passed away, the latest game in the series was Mystery of the Emblem. I included a copy of it as part of other memorabilia with his coffin. After that, when sorting through the things he left behind, I came across his copy of Dark Dragon and the Blade of Light, as well as Gaiden. Needless to say, I reminisced about the times with my deceased father as I played through them. As such, I have an incredibly strong emotional attachment to these two games. Q: Was his save data still on it? Yamagami: So when we heard that, we couldn’t help but say “Yes, you can definitely have this job!” We just couldn’t help it, after hearing that story. But it also helped that he was quite knowledgeable about the franchise in general. So we figured it was okay. Kusakihara: I also have fond memories of the first two games. Going back to the time of Dark Dragon and the Blade of Light’s release, I remember I lacked a Famicom. I would have to go to a friend’s house to play it. I could never make it to the last level… And then Gaiden came out. I was so determined to play it through that I ended up borrowing my friend’s console and game, and then played it on a small five-inch black and white monitor while staying hidden from my parents. (Laughs). I remember it being really difficult since I couldn’t differentiate between enemy units and allies because it was a black and white monitor. After all that I finally got to play to my heart’s content –and then was quite surprised to hear that there was now a sequel coming out to the first one I never beat. It was time to go back… (Laughs). Nakanishi: Gaiden is pretty different from the other games in the series. Yamagami (While keeping a forced smile): That’s right. Completely different. I was in my second year at the company back during its development. I would have to take the last train every night after I was added to the debug team. We were all pretty bad at the debugging thing back then. I was originally added as part of the debug team for Dark Dragon and the Blade of Light, so figured I’d do better this time. We cut it uncomfortably close to that game’s eventual release. So building on that experience, I was all set to debug Gaiden well before the deadline. But then color me surprised –all the rules of the game were completely different! To add salt to the wound, it was much harder than the first Fire Emblem game too. I’m the meticulous type who takes it very slowly and thinks about every step. So I would reset over and over again each time someone died (Laughs). I only ever got to see the ending once. My memories of the game are rather painful, so I got cold feet when I heard that a remake for Gaiden was suggested (laughs), but it was a big relief when I heard it would not be that difficult this time around. Higuchi: Certainly, Gaiden left many with the impression it was too difficult. It’s not New Gaiden, but instead a title that can be the same around the world. Q: What was your aim with the title Echoes? Translator’s Note: Gaiden is a Japanese word that basically means “side story.” It is the word for “sidequests” in FE7 and other FE games for instance. So you can see why this may cause confusion for the Japanese players. Yamagami: Avoiding calling it New Gaiden is something we had in mind from the start of development. At the same time, we wanted a title that the rest of the world would also use, so wanted to settle on an English word. Somewhere in that conversation, the word “echoes” surfaced. We imagined it was fitting as older games could now “echo” to the modern players. We were very pleased with the choice, and, if there were to be more remakes in the future, we figured we could use the Echoes title again. Q: What were some of the other names you had in mind? Nakanishi: Well we wanted something that keeps the feeling of a “remake.” So one idea was attaching “Re:” to the title. It was pretty popular with the development team, but the foreign branches suggested “再度(saido)*” instead, and so it was out of the final short list. Higuchi: There was also an idea to simply use a capitalized “G” (for Gaiden) as the title and leave it at that, but that idea didn’t get very far. Q: Mr. Yamagami, as the producer striving to ever expand the audience, what sort of plans do you have with this game? Yamagami: This time, the aim is to get the fans that joined the Fire Emblem series since Awakening to be made aware of the fact there are indeed games that came before it. As such, we wanted to implement familiar mechanics, but at the same time retain what made Gaiden what it was. But a major focus was reducing the difficulty level from the original to make it something more like what new fans could look forward to. But of course we are not just focusing on the new players, but those who also had played this game in the past. Q: And in addition to that, the visuals have evolved quite a bit with Fates, and yet in this game they retain a sort of nostalgic charm to them. Higuchi: The weapon triangle as we know it in the series started in Genealogy of the Holy War, so Gaiden lacked it. Weapons had few unique characteristics, and terrain was very important in influencing the outcome of a battle. We had to seriously take these factors into consideration this time around. Some may find these features nostalgic, while others will find them brand new. We have seen both reactions from our in-house test players. Kusakihara: The mechanics and such in Fates are rather complicated, so we wanted to return to more simplistic gameplay in a way. It became very user-friendly, and at the core retains the essence it had all those years ago. Q: Did you have to go back and research Gaiden for the remake? Kusakihara: Of course. We had to refer back to Gaiden over and over again, and discovered it was quite well done. For example, it really is hard attacking a fortress. The archers hamper invaders rather well. There is also terrain that really hinders movement, which has a great effect on enemy (and allied) offensives. There is also the feeling of realistic battles in narrow hallways where people barely have room to move and yet still have to fight to the death. So to stick with that, we did roll back to a system without the weapon triangle for one that favors terrain as the central strategic influence instead. So now we get things like aiming to position units on the best terrain while watching out for mages (who are not affected by the terrain) and so have to prepare archers to counter them, etc. Q: Please tell us about some other things you are keeping from Gaiden, and other things you are improving. Higuchi: Well we added some things that will influence accuracy. Things like support bonuses and battle skills will increase the breadth of the game, we feel. Nakanishi: In addition, character growth rates were really bad in the earlier Fire Emblem games. It was common to only get a measly one or two stats increased per level up on average. We agreed it was better to change this up to more modern standards. Higuchi: While we made improvements overall, things like archers’ range remains from Gaiden. Q: With new things like better growth rates and skills that didn’t exist in the original, did you have to consider tweaking balance from the beginning of development? Kusakihara: We based it on the original work and made our small adjustments from there. However, with the growth rate adjustments, there comes a big discrepancy between allies and enemies later in the game. So we added some (somewhat unreasonable) components in there to balance it. For instance, “Megaquakes” and the Witch’s Warp*. Also, the AI was originally customized to be like Fates, but we purposefully tweaked it to be more like Gaiden’s instead. *A gimmick from Gaiden. Megaquake would damage everyone on the map. Witches meanwhile would warp anywhere on the map unimpeded. The ideal character designer from Awakening: hiring Mr. Hidari. Q: Why did you decide to ask Mr. Hidari to be the character designer this time? Higuchi: Well, we kept hearing Kusakihara singing his praises, saying that his artwork has a great charm to them. We heard of him when working on the Einherjar Cards* in Awakening, but he was too busy so it was a no-go. When working on FE0 (Cipher), we had another opportunity to ask him, but the timing didn’t line up well there, either… This time, though, we set up a meeting with him in advance, and the timing happened to line up very well. *Add-on content in Awakening. You could use them to summon heroes from other worlds (=past games). Q: Sounds like quite the drama! What sort of topics were discussed at the meeting with Mr. Hidari? Kusakihara: Quite a few things, actually. Things like discussing characters that wear armor to how units would look moving around in full view. We were also pretty detailed in our explanations to him [as to what he could expect]. Q: Did his work go smoothly, then? Kusakihara: There were several retakes for Alm’s design, but after that Mr. Hidari got a handle on things and was fine on his own. Q: Does the final design or Alm differ significantly from the initial one? Kusakihara: The current one is actually the fourth take. The first time, he was rather scantily equipped, so I asked him, “Please add more armor on him.” But then he ended up a little too armored. Then I asked, “Make him look more like a main character may look.” So, his armor became rather extravagant. After these few takes, the final design we settled on had some elements from each of the previous steps combined into one. Nakanishi: When one thinks about where Alm stands, it becomes even harder to settle on a design. He has the rare honor in the Fire Emblem series of being a protagonist that is not part of a royal family. As such, we wanted to portray him as one who has to work to gain recognition as a leader. With that in mind, a major emphasis during his design stages was that we did not want to give him a princely appearance from the start. Mr. Hidari may have had a bit of trouble trying to find that middle ground. Q: Did the other characters live up to the image everyone had in mind? Nakanishi: Personally, I was most surprised by the changes to the three villagers. Kliff, especially, went from a guy with an overbite to this really pretty boy! (Laughs). Kusakihara: If you compare how characters looked in Gaiden’s manual with the game itself, you can see there were already great differences with the pixel art versus manual art. So we also had to have a lot of discussions regarding which of these two to base the designs after. Q: Everyone really did become a lot prettier. Sometimes I find myself gazing at the bottom screen even during a battle. Higuchi: Speaking of that bottom screen, both Mr. Nakanishi and Mr. Yokota made it very clear they wanted face portraits there. Nakanishi: Because it was just too cool to let go to waste. I even wanted them on the top screen! Kusakihara: The truth is, there was actually talk of doing this with Fates too. But we couldn’t implement it in that because the screen was already cluttered with all the detailed information we needed to show. Q: All the characters will probably become more popular than before, huh? Nakanishi: Well, in the original work there were a lot of characters that were hard to gauge in terms of personality. A lot of them would not even speak after one or two conversations. This time they all have individuality, as well as voices, so one will be to get a better insight of their character this way. Q: With Gaiden as a base, you added quite a few new features. Please tell us more about that. 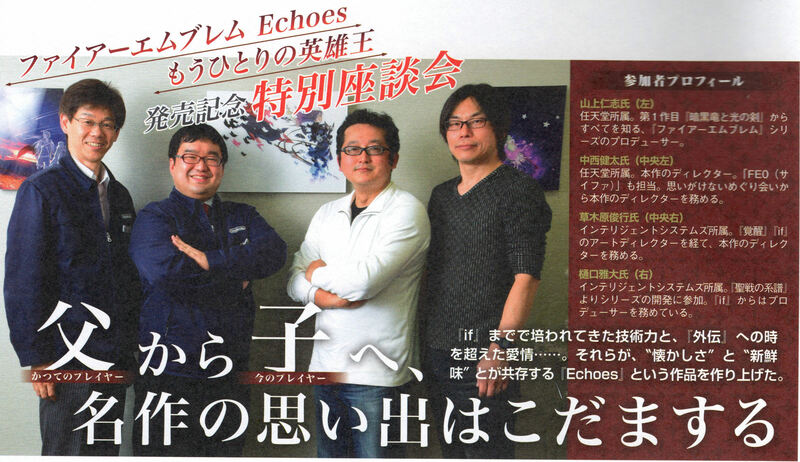 Kusakihara: First of all, Echoes is, at its core, RPG-like. There is no avatar this time, and instead you play as Alm or Celica. We hope players will have an increased sense of empathy with them when they see the world from their point of view. We also added options to explore villages to get a better sense of life within them, as well as being able to speak with villagers, inspect areas, and talk to allies in first person (as the main character). Upon entering dungeons as Alm or Celica, we wanted players to feel what they feel, and aimed to make it like the player experiences the five senses as they would as if they were there. It was a central aim of this production. Q: And as for the skills? Kusakihara: Skills are just one component of an RPG. The sort of thing you take into consideration when equipping the unit with along with items. We prepared some skills special to this game, so please take a look at how they look within the battle animation itself. Of particular note are Alm and Celica’s special moves, as well as the Triangle Attack. Q: On the topic of battle animations, please share some thoughts on them this time around. Kusakihara: I was once again in charge of the same staff that oversaw the battle animations in Fates, so we all implemented things we didn’t get to implement in Fates. We elaborated on the counterattack animation, for example. Nakanishi: Things like slow motion, sword movements, or dodging to the side. Other things like arrows actually hitting their target when fired from a distance, too. Kusakihara: Some other things may be harder to notice on the surface. For instance, climbing stairways in the dungeon, the feet actually connect to the steps at the proper height and such. Before this, we often took shortcuts and dodged all the minor details, but this time, we paid attention to all of that. Q: Speaking of “connecting,” what were your intentions with wireless communication features this time around? Higuchi: In addition, there is a StreetPass function where other players bring along rumors, which, if followed, leads to treasure. Q: Is there any amiibo communication? Kusakihara: Yes, but very few uses. You can transfer only Alm or Celica’s data onto them, and let other players borrow it. For example, imagine a child who gets stuck facing an incredibly hard enemy. His father decides to help him by lending him his stronger characters. The idea was a way to allow family to play together like that –as we live in an age where we [the adults] may have played the original Gaiden. Q: When you think about that with the memories Mr. Nakanishi recounted earlier, you can’t help but feel warm and fuzzy inside. Kusakihara: There is one other function [for amiibo] involving dungeon exploration. 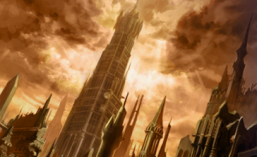 For Alm, there is the “War God’s Trial” which involves challenging five powerful boss characters. You receive items upon your victory. You can retreat if you can’t defeat them, so it’s a nice indicator of how far one has progressed in the game. Higuchi: Maeda* served as director from New Mystery of the Emblem through Fates, but this time Kusakihara has that role instead. He recognized the better points of Gaiden and brought those the RPG-esque feeling to the forefront combined with the new style of Fire Emblem games for us. Aside from what we mentioned already, there are also other fun things such as characters and meal preferences, as well as seeing if some quests in some villages have been fulfilled when you return to them. This game is packed full of things like this, never before seen in this series. One gets the sense that people actually live in the continent of Valentia, and we were happy to deliver an experience that breathes life into the setting. *Mr. Kouhei Maeda. Works for Intelligent Systems. Has been a developer since Binding Blade, and served as director on New Mystery of the Emblem, Awakening, and Fates. He is currently the director for Heroes. Kusakihara: I was so particular about ensuring that would be the case –to the point release got delayed. Sorry about that. The new Nintendo console even came out before it. But, now it is even more like the original Gaiden! (Forced smile). Nakanishi: Indeed, as Gaiden was released after the Super Famicom had already come out! (Laughs). Q: With the remake, the story has been expanded upon significantly. Please share some highlights of it with us. Kusakihara: Gaiden’s central theme was always about a confrontation between the opposites, such as “strength/love” and “men/women.” Alm pursues a path to power, Celica stands on the side of love. Nakanishi: Duma and Mila are the very representations of power and love. This battle isn’t really portrayed in the original Gaiden’s story, though. All of that was written in the manual instead. If one didn’t read the manual, they would be rather confused why they suddenly switched to a different character in chapter two of the game for seemingly no reason. We wanted to make this story known to all players of the game, so many scenes were added for this purpose. We added voices and an entire prologue that shows the two in childhood and their relationship, for instance. Q: Characters like Saber in Celica’s army appear a lot more often than before, too, it seems. Kusakihara: When expanding upon a story, an inevitability we face is that without a narrator, we can only do so much to widen the scope of the tale. So Saber is in place in Celica’s army, and even if he is lost in battle, can still tell his story, for instance. Nakanishi: It is not exclusive to Saber, either. There are always a few characters that must be there for the story to continue among the many others [who can die]. Q: Speaking of new characters, please tell us what the idea behind adding the new character Faye into the story as one of your initial allies. Kusakihara: Well, the main reason is simply that Alm’s army was all men otherwise. I also wanted to add some uncertainty to otherwise predictable elements. In this case, she is a loving childhood friend with Alm, even though Alm himself shares his special (and mutual) connection to Celica. We want players to enjoy learning more about what kind of girl she is. Nakanishi: She’s also there to give players who have already played Gaiden something new to look forward to. Q: Things like the lower screen are obvious, but the fine tuning of the world setting as depicted is all unique to the remake, right? Kusakihara: Yes. Gaiden had its setting and history written in the manual. But this time we wanted to depict what kind of events could lead to the current friction between two countries. We put a lot of thought into placement of forts, buildings, and backgrounds in order to fill in the gaps that existed in Valentia’s history. Q: The characters feature full voice acting during events too. Was this decided on from the start? Higuchi: Yes, we had decided on that from the very beginning. There are a lot of dialogue scenes with the character portraits, which alone would not really convey emotions and tones properly. To truly convey tense moments, happy moments, or those that can fluctuate in emotion suddenly, we felt that voices were absolutely necessary. Q: Though not directly related to Echoes’ contents, how do you feel about Fire Emblem’s constantly expanding popularity? Yamagami: As we said in an interview with the company president about Awakening*, though the Fire Emblem series was known by many, its sales were subpar up until then. We needed to sell more games, and often overthought how to go about doing it. Mr. Higuchi and I also constantly had opposing viewpoints on how to go about doing this, too. * Iwata Asks, a developer interview with the late president of Nintendo. Yamagami: I felt I had to make it more interesting to potential customers even if it meant changing things up significantly if need be. But Mr. Higuchi did not want to change it too much out of fear of losing what makes Fire Emblem what it is, and was protective of it that way. Our opinions were at complete odds with each other, not much could be done, really. I was still young at the time, so had little influence and was bad at wording my arguments. So I made a proposal in hopes of compromise. From that, New Mystery of the Emblem gained a casual mode where no units die. It was well received –and yet the sales did not improve. So, at the beginning of Awakening’s development, we were warned by the parent company: “Look, if the sales continue to be subpar, then this is your final game.” Hearing that, the development team went, “Well, since this is probably the end, we can just do whatever the heck we want. Let’s throw something together with no regrets!” Everyone threw out various ideas and ways they could be implemented. Yokota and Maeda especially emphasized wanting to depict characters with their own unique traits and individuality. To that end, they brought in Mr. Yusuke Kozaki* as they felt his style was a match for Awakening and a way to bring it to a greater audience. *Mr. Yusuke Kozaki. Illustrator. Has contributed various illustrations to the series since Awakening. Nakanishi: That game ended up selling over one million copies overseas. Yamagami: I wasn’t even thinking of the overseas audience at the time, so was quite surprised by those results. Anyway, the company then came around simply asking: “When’s the next one?” (Laughs). The exchange that followed went something like: “Didn’t you say this is our last one? !” “Well it sold, so that’s how it is.” Even though it was a rather silly argument, deep down I just felt a great sense of relief. Q: And so along came Fates. Yamagami: As a follow up, we decided it should have even more characters. So we implemented something I wanted to do for a long time: “Depending on the characters you choose, the story changes. Two versions!” It was a plan we stuck with through release. We gained many new players this way, and have taken on the company’s challenge of venturing into smart phone gaming as well as card games. From my point of view, the harsh times lasted way too long, and so, I intend to make the most out of this recent comeback. Of course, we’ll always be thinking of new ways to appeal to the customer base and acting upon it decisively. That is the most important thing for us. Higuchi: We are incredibly thankful that more people took notice of this series through these methods. We have dropped the notion of “A Fire Emblem game must be like this” when approaching new titles, which allows people to always experience something new. It is also a challenge to inevitably face every time it comes to picking up an older title. With a card game and smart phone title, Fire Emblem no longer has just one way to play. Q: What are your thoughts, Mr. Nakanishi? Nakanishi: I have the privilege of being the director (for better or worse) for FE 0 (Cipher), and am glad to see Fire Emblem fans able to better interact thanks to Cipher and Heroes. I feel that these titles have increased the size of the fan base in general, too. Echoes is not just a title for these new fans, though, but also a work we put our heart into for fans who love Fire Emblem and have supported us through the years. We feel that it can be a game that brings old and new fans together to mutually enjoy. Yamagami: For this work, we dug deep into the original during development and were like: “Wow, the game was like this?” With Gaiden as a base, we expanded on the game’s dark story with the technology we used for Awakening and Fates. It essentially became a whole new game. Q: And your thoughts, Mr. Kusakihara? Yamagami: Huh? But what about that? *TN: Likely the same game I translated developer documents for from the 25th Anniversary book. See that here. Kusakihara: Real time really is tough… (Smiles bitterly). But, we came up with the tech seen in Awakening at that time. Things like the 3D motions and sequences. Yamagami: Incidentally, that was the 13th work. I was not aware of it time, but that’s a rather ominous number huh? Kusakihara: It just reminds me that I have to work harder [to achieve my goals], really. I am proud and quite happy with the extremely positive response Echoes is getting, though. Also, since various teams are shifting around with some mismatches that are inevitable, I hope to form strong connections [that will let us avoid issues]. Q: Lastly, Mr. Yamagami, please say some a few final words for the readers. Thank you all for continuing to support the Fire Emblem series in the future! There’s a lot to take away from that interview! The story of Yamagami’s father to how Higuchi wanted to keep Fire Emblem as it was. Imagine how many things could’ve been different. Certainly topics for another day! This interview took about 12 hours of valuable free time to transcribe/translate/edit… but I’m glad to have had the opportunity to bring this all to you. Please support me by donating if you’re feeling generous! : ) It helps support my passion. This entry was posted in Fire Emblem, Interview, Magazine, Translation, Video Games and tagged 3ds, april 2017, awakening, dengeki, developer interview, echoes title, fire emblem echoes, fire emblem gaiden, fire emblem wii, gaiden, new gaiden, radiant dawn, switch, translation, Trivia. Bookmark the permalink. Thank you for the translation! I thought Hidari was a guy, though? Hello, Hidari had always been an odd case, going purely from text you see some female first person pronouns used, but someone pointed out a tweet where they do say they’re male, so unless they’re trolling, I’ve edited it to fix that up. What a troll, using female first person pronouns even on that post. xD Thank you though, I tried going to their homepage but it was down, so please don’t worry, this is not a nitpick at all, and I’m happy to correct it. Thank you for the link! Welp, the whole “Faye was meant to be unlikable” theory got shot down. She really was just ballsy yandere pandering.